Pancreatic Cancer Challenge: Know it. Fight it. End it. Please take a moment and send Congress an urgent message to increase funding for pancreatic cancer research by filling out the form here. Carmen recently sent me this “Take Action Now” message from the Pancreatic Cancer Action Network (pancan.org). Pancreatic cancer is the 4th leading cause of cancer deaths in the U.S. Every day there are approximately 116 people diagnosed with pancreatic cancer. More than 35,000 people will die from pancreatic cancer this year. The five-year survival rate is only 5%. 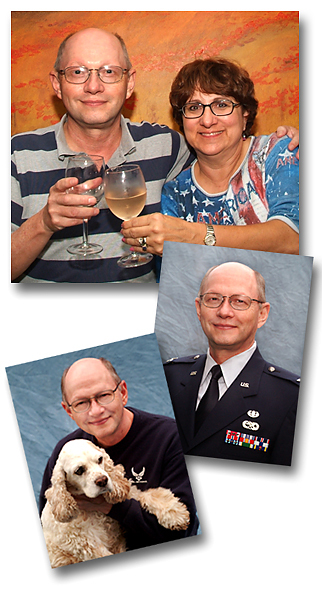 Carmen’s husband, George Ledbetter, lost his fight with pancreatic cancer on November 9, 2007. He was a very dear friend and is still very much in my thoughts. Only 56 when he died, George rose to the rank of full-colonel during his U.S. Air Force career, and had retired from that service some two years before his death. He was brilliant and witty, and filled to the brim with stories of his career as a military attorney. Some of his stories Carmen deemed “not quite appropriate for mixed company,” but he always responded to our pleas for him to “tell it anyway.” He was completely enamored with the world of finance, and when he retired he began studying to become a financial adviser. However, he was never sure whether he would pursue that profession on completion of the intense course. George was a familiar sight to the staff at a local McDonald’s restaurant. He spent several hours there every morning, eating breakfast and drinking coffee, with his workbooks and notepads spread over a table for four. We each offered up a variety of plans, items such as “pay off all my bills, buy a house in the mountains, or on a lake or on the beach, travel the world, build a giant studio in a barn, save the animals (insert species here), fund animal rescue leagues, etc.” George, usually the last to respond in such conversations remained quiet, listening closely while forming his answer. Michael says he thinks about George every day, primarily because George taught him a stretch exercise to avoid foot pain caused by a shortening of the Achilles tendon. Michael has done this stretch faithfully every morning since learning the exercise. After Carmen retired she embarked on a new career, and she and George moved into a beautiful home in South Carolina. Restless in retirement, George returned to Alexandria every chance he got, frequently by agreeing to babysit a friend’s dogs whenever she was out of town. During those solo visits we continued meeting frequently for lunch. His favorite restaurants were Ruby Tuesday and Roy Rogers, and while there he would offer up firm opinions and lengthy diatribes, give sage advice and voice acute observations on a variety of topics—everything from politics to finances, and from celebrities to neighborhood gossip. George was a consummate conversationalist—no topic was taboo, no subject uninteresting and no angle unexamined. He had what we felt was an unwarranted fear of health problems—George was physically fit and took daily walks, but his fears concerning his health were always present in our conversations. His greatest fear was that of developing diabetes, a condition that was prevalent in his family. We found it very sad and ironic that he would ultimately be diagnosed with pancreatic cancer, a devastating and incurable disease which usually strikes without warning—those afflicted rarely see it coming. I shot the photos above at our Second Annual Pesto Fest in 2006. They show George and his wife Carmen toasting, George in uniform for his retirement ceremony, and George with Angus, his beloved Cocker Spaniel. This is a Polaroid transfer I made of an image I shot in Maine back in the 90s. 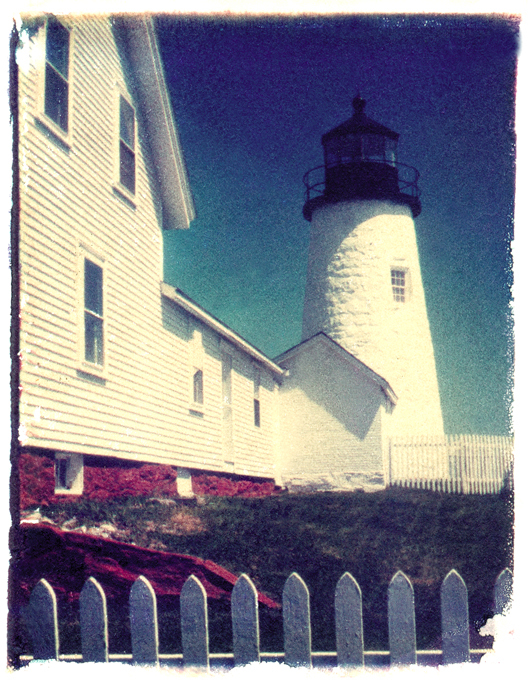 The Pemaquid Point Lighthouse is located at the entrance to Muscongus Bay and Johns Bay, near the town of Bristol. Read about the history of the lighthouse here. Fun facts: Congress appropriated $4,000 for building the lighthouse in 1826. The land was purchased from its owners for just $90! It was built for just $2,800, and forty-year-old Isaac Dunham of Bath, Maine, became the first keeper at $350 per year. Check out the Pemaquid Point webcam here (it appears that today the snow has melted, but what a difference a day makes—check out the view from 1/24/2009 here). Want to learn how to make Polaroid transfers from your slides? Check out Sarah Wichlacz’s visual tutorial here or download Holly Dupré’s free online book here. I made all of my transfers using a Daylab Slide Printer and Polaroid 669 film. I still have a boatload of 669 film in my storeroom (stored in a cool, dry place, of course). I should get printer out and make some new images soon! Check out the collage of my favorite transfers in my posting on October 21, 2007 here. I ran a “tell me your favorite garden story” contest with a pack of my notecards as the prize—and didn’t get even one bite. Kinda surprising you can’t give away free things these days! That posting can be found here. Anyone interested in free notecards? Tell me a story! I received the sample magazines I purchased from MagCloud (http://www.magcloud.com) and am quite impressed with the reproduction quality. I ordered two—Plant Society by Matt Mattus and International Photographer by Bryan Patterson. I was really impressed with the quality of both the paper and the printing. MagCloud allows you to publish your own magazine using any layout program (InDesign, QuarkXpress, Photoshop, Microsoft Word, Microsoft Publisher, Apple Pages and Scribus—see specs and download templates here). When the design is completed, you must export to Acrobat pdf format (read their “how to publish” specs here.) You upload your pdf to MagCloud, fill out the description, and order a proof, which they print, bind and mail to you in two weeks or less. You review the proof, make changes (if necessary) and upload a new pdf file. When you are happy with the final proof, you mark the issue as “published” and set the price. MagCloud charges 20 cents per page and the publisher (you) specifies any markup above that. With the issue “published,” visitors can buy it on the MacCloud website using a credit card or their PayPal account. Orders can be shipped to the U.S., United Kingdom and Canada. More countries will be added in the future. When someone orders your magazine, MagCloud prints, binds and mails the issue to your buyer. You can also send an order to a group of people using their “Ship to Group” capability. Publishers collect royalties via PayPal. When publishing any magazine, your publication must be set up in “signatures” of four pages. This means your publication can be 4, 8, 12, 16, 20, 24, 28 pages, and so on. The total number of pages in the file must be evenly divisible by four. A MagCloud magazine can be as cheap as .80 cents per issue (4 pages—perfect for a marketing brochure! ), all the way up to MagCloud’s maximum of 100 pages at ($20.00 per issue), plus shipping. You determine whether you want a markup above the cost of printing to be added for your audience/buyers. From the MagCloud website: This service is ideal for publishers of small run magazines—special interest groups, clubs, schools and niche magazines—looking to minimize their setup, operational and print costs, and increase their advertising revenue. MagCloud also offers a great opportunity for electronic magazines and popular blog and website owners who are looking to provide their readers the same great content but in a portable and slick printed magazine style format. Check out the “recently featured magazines” here, or use the search feature on MagCloud to look for magazines on topics that interest you. Some publications are personal efforts (such as family albums, cookbooks, calendars, design and photography portfolios, etc. ), while others are published by businesses and associations. Even actor Ashton Kutcher has jumped on the MagCloud bandwagon—in collaboration with GQ Magazine, HP, and The Gentlemen’s Fund, Kutcher published a photo essay to raise awareness of the flood that devastated Cedar Rapids, Iowa in the summer of 2008. All proceeds from the sale of the magazine go to support the rebuilding of Cedar Rapids. Learn more about the publication and see an online preview here. One Respe: A Photographic Benefit for the Survivors of the Haiti Earthquake features the donated works of several photographers, including photojournalist Mary Ellen Mark. All proceeds from the sale of this 40-page publication go to the American Red Cross International Response Fund for Haiti relief. Love dogs? Love Shirl Magazine, a 56-page, ad-free magazine published by Lee Spillennar, is whimsically designed and highlights living, working and playing with your dog. Check out Lance Armstrong’s LIVESTRONG Quarterly, published by Spot On Media LLC, with stories of survivors, athletes, advocates and articles on healthy living, nutrition and cutting-edge medical advances. Publish a magazine showcasing your photography! James Worrell has done just that with Food for Thinking. Drinking. Eating. and Make-Up. Give family members their 15 minutes of fame with a family reunion magazine like publisher Andrea Bagley has done with Roeber Family Reunion. Having trouble getting things done? Check out publisher Michael Sliwinski’s Productive Magazine. Frog lover? 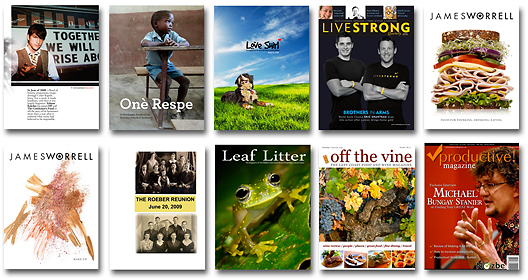 Check out Leaf Litter, published by Tree Walkers International, with beautiful photographs and articles related to amphibian conservation, ecology and natural history. Are you a Foodie? Check out Off the Vine Magazine, published by Jennifer Anne Shorr. This 44-page publication covers new flavors, fine dining, travel, wine review, cooking and beautiful photography from the west coast. Publish your own calendar! 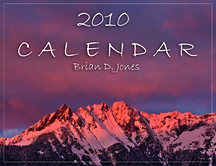 Take a look at Brian Jones’ 2010 Pacific Northwest Nature Photography calendar. The publication runs 28 pages, so the cost is approximately $5.60, plus shipping. The list price is $10, which gives him just over $4.00 profit (won’t make him rich, but it’s something if he generates enough interest for volume purchases!). If making money isn’t your priority—say, you just want to publish your family reunion magazine and have it available to your family to purchase directly, you can list the price for the actual cost. The best part: you can use your calendar for marketing purposes. There is no minimum order, so order only what you need—no excess inventory in your studio. I really love this concept and have all sorts of ideas spinning in my head right now! In between design jobs and the massive spring cleaning I’ve undertaken, I’m working on a “how to photograph your garden” magazine with photographs and how-to articles. I hope to have the magazine available for purchase by early summer. If the venture fares well, I might make it a regular series on different topics (how to photograph portraits, weddings, special events, landscapes, etc.). I’m now inspired to put together a portfolio magazine with my garden photographs, accompanied by my own poetry and garden essays as well as some of my favorite works from other poets. I’m letting each image I pull from my archives inspire the design and this is one of the layouts that is completed. 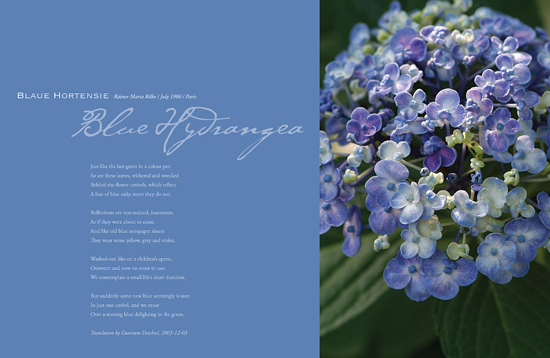 This two-page spread features a lacecap hydrangea I photographed at the Atlantic Botanic Garden. The poem is by one of my favorite writers, Rainer Marie Wilke, and has been translated by Guntram Deischel. Originally posted in January, 2009—I apologize in advance if this ginormous collage crashes your system. I realize I got a little carried away with my collection. Pink just plum(b) took over. Their recent comments gave me the impetus to post the colossal collage below. I replied to Heather that I would soon be posting a rather long “pink collage” that could potentially crash her system. She replied, “bring it on!” So that’s the skinny and here we are. Okay, the color pink wins by a long shot (so far) in the number of times it shows up in my garden photo archives. I thought orange was prevalent, but I was so, so wrong. I can only imagine how many times purple will show up—I tend to gravitate toward that color in my garden, even though I wouldn’t dare actually wear that color. Actually wearing that color or any shade of burgundy makes my skin itch. But that’s a whole ‘nuther topic. We artists are very sensitive to color, you know. Well…now that I have revealed this little-known (and useless) fact about me, I should also tell you that I will not drive a burgundy car—and my anxiety doubles if the interior is burgundy, too. I discovered this about myself about 20+ years ago. So just guess what color car I am inevitably assigned when I rent a car. Yep. Burgundy. Or red (which I don’t have as much an aversion to after driving a sporty little Jeep in California two years ago…red = acceptable…burgundy = don’t go there). It doesn’t matter if every car left on the lot is white. The rental agent will start walking, keys in hand, directly to the only burgundy car in the place. I kid you not. Ask my cousin Bill. (He recently confessed that he now asks for “anything but burgundy” and “no rental plates, please”—the second request came about after I read something about never-do-wells stealing from rental cars because they know they’re driven by tourists with some good loot in tow.) And if someone traveling with me is renting the car, they usually don’t care what color it is, but I always comment, “betcha it’s going to be burgundy, mark my words.” Then the rental agent will lead us to only burgundy car in a sea of other colors. I kid you not. I’m jinxed. So now when I rent a car, I request “anything but burgundy, please.” This request is met with raised eyebrows more often than not. And I feel compelled to explain, “I’m an artist. I’m sensitive. No burgundy, please.” On one trip to San Diego, Michael went to rent the car while my friend Norma and I waited in the parking lot. It was late in the day and we said if burgundy is the only one available, then we’ll take it (but we won’t be happy about it). I said, “I just know it’s going to be burgundy.” Michael got the keys and met us across the parking lot and was laughing uncontrollably. But wait! Under the vapor lights…it could be…it just might be brown…yeah, it’s brown. We got out of the parking lot and saw the real color…yep, you guessed it. It was burgundy. Once again. Now I must admit I don’t mind using it in my graphic design pieces. Burgundy has always been a nice corporate-y business color. And I don’t mind if other people wish to wear burgundy or drive a burgundy car. Just don’t ask me to ride with you. Especially if you’re wearing burgundy in your burgundy car with your burgundy seats. I will then offer to pick you up in my passive silver car with its quiet, unassaultive gray interior. I will not apologize for this particular peeve of mine. It is what it is. Now back to pink. There is an off chance that I actually have something pink in my closet to wear. If not, I should. I do believe all women look good in pink (in particular shades depending on their skin tone and hair color), even if they don’t think so. I speak from experience as a portrait photographer. It’s a very flattering shade on women. And sometimes on men, too. There’s something youthful and joyful about the color pink, especially in the garden. And I love all the pinks in my garden—from pastel pink to just-look-at-me! magenta. The use of the word for the color pink was first recorded in the late 17th century, describing the flowers of pinks—flowering plants in the genus Dianthus. Just 49 more days until spring, huh? Can it be? Oooh…now it’s just 48! “Organized chaos,” was Michael’s response yesterday when I asked him to describe the front yard garden. I also asked him to guess what passersby might be thinking. I’m thinking they think I have too much time on my hands…or perhaps I have an illness that could be regulated with medication. I must say that when I’m in the kitchen, near the windows overlooking the two sides of the garden, and someone goes by—I try to catch their expressions and see how long their eyes linger over the garden. So many just pass by without even a glance to their right. How in the world can they do that? Those that take time to pause from their running, walking, jogging, baby-stroller-pushing, dog-walking jaunts get a silent stamp of approval from me. Aside from my own visual gratification, I create this “organized chaos” for them, too. Recently my friend Gina spent an entire afternoon helping us clean up the backyard and plant those last few bulbs and impromptu plant purchases from the Green Springs Garden plant sale last weekend. I cajoled her into taking leftover bulbs, excess plants, garden ornaments, an old table, empty pots, etc…anything to just get my backyard looking like paradise again. She and Michael kept shaking their heads every time I came up with a statement like, “oh…um… I forgot about the free sundrops someone abandoned in the parking lot. Where should we (shove) those?” Or, “if we just stake up that bunch of plants, I’m sure we can find several inches of valuable real estate in which to plant these lily bulbs I forgot about.” Or, “we’re almost done, guys, just six more things to plant. Okay…I forgot about those, okay, eight more things, and then we’re definitely done.” I confess. I’ve never met a plant I didn’t like. I take great comfort in knowing that I am far from alone with my disease. I’m in such good company with other plantaholics! The liatris, a favorite of bees, are just a quarter of the way to their height. A bank of lovely lamb’s ears, started with cuttings from Karen’s garden, offsets the other plants with their silvery green hue. The Autumn joy sedums are puffing out, waiting until everything else steps out of the spotlight for it to shine in the fall. Michael’s olfactory favorite, the moonflower, is slowly making its way up a trellis on the front of the house. Yesterday, I planted mina lobata (firecracker vine/Spanish flag) in a pot at the bottom of the steps (just so I could get more photographs like this beautiful one I shot last summer: https://cindydyer.wordpress.com/2007/09/03/mina-lobata/. In front of the pot I planted three new coneflowers and another shasta daisy. We added another hellebore to the large bank (another offering from Karen) in the shade. On the front porch, there are two topiary frames planted with hyacinth vines. My beautiful (and very photogenic) stargazer lilies have returned, making their way upwards from a terracotta pot. Three baskets hang over the railing, filled with verbena, sweet potato vine, allysum, marigolds, portulaca, and marguerite daisies. Farther up, in front of the morning glory trellises, everything is verdant. When that area begins to peak this summer, there will be a profusion of lavender, multi-colored lilies, silvery purple thistle, yellow black-eyed susans and sundrops, take-your-breath-away Heavenly Blue morning glories, red bee balm, deep pink butterfly bush blooms, grayish-greenish-blueish sea holly, blue-eyed grasses, shasta daisies, various other sedums, and white, purple and orange coneflowers….I’m sure I’m forgetting something. I replied to Michael, “Organized chaos presumes I did not have a plan.” To which he countered, “There was a plan?” Of course there was a plan. My plan incorporates textures, scents, colors, varying heights, creepers, crawlers, climbers, and a botanical variation of Noah’s Ark—two of everything, please. How is that not a plan? Thank you to my friend F.T. for sharing yet another fascinating item with me this morning. He wrote: Watch the 2-minute video that shows a drop of water falling into a puddle at 2000 frames a second. You will see something totally unexpected. It is the first time the physics of the event were explained to me.